A balanced diabetic meal plan should include between 2 and 5 ounces of protein-rich foods daily, says the American Diabetes Association. Poultry, fish, shellfish, dried beans and legumes, soy, nuts, seeds, eggs, beef and cuts of pork such as ham can all contribute to this recommendation, though some choices are healthier than others. Talk to your doctor or a dietitian if you need help planning a diet that can help you manage diabetes. A serving of fresh ham prepared without glaze or sauce does not contain any carbohydrates and has a glycemic index of 0. This ham will not affect a diabetic's blood glucose and can help maintain a steady blood sugar level. However, prepackaged lunch meat ham, sugar-glazed hams or honey-baked hams may contain between 4 and 15 grams of carbohydrates per serving. The ADA advises diabetics to check the nutrition label for carbohydrate information before eating any meat products that may have added carbohydrates. It's important for a diabetic to limit his intake of sodium. Diabetics have an increased risk of developing high blood pressure and should consume no more than 1,500 milligrams of sodium each day, according to the Cleveland Clinic. 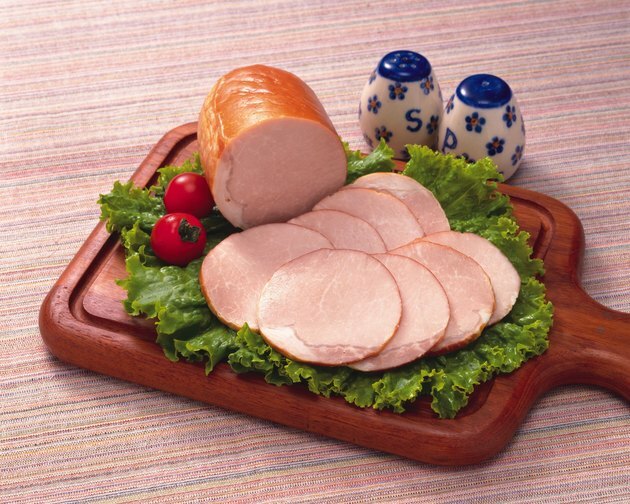 A typical slice of regular ham can contain 320 milligrams of sodium, or over 20 percent of a diabetic's daily limit. If you choose to eat ham, look for low-sodium brands or cook your own fresh ham without adding salt or high-sodium seasoning blends. In 2011, an "American Journal of Clinical Nutrition" study reported that eating red meat -- including processed meats like ham -- increases the risk of Type 2 diabetes. Additionally, an "Archives of Internal Medicine" study reported in 2012 that people with a high intake of processed meats are more likely to develop chronic medical problems, including cancer and heart disease. Their results indicate that by swapping one serving of red meat per day for low-fat dairy, plant-based proteins like beans, poultry, or seafood, you may be able to lower your risk of dying from a health condition by as much as 19 percent. The Harvard School of Public Health advises that everyone, including diabetics, should eliminate all types of processed meats like ham from his diet and consume a maximum of two 3-ounce servings of lean, fresh red meats like pork, beef or lamb per week. When you do consume ham, do it in moderation and only occasionally. Try to use only small amounts to add flavor and make sure the rest of your meal is heavy on whole grains and fresh produce and light on sodium and fat.